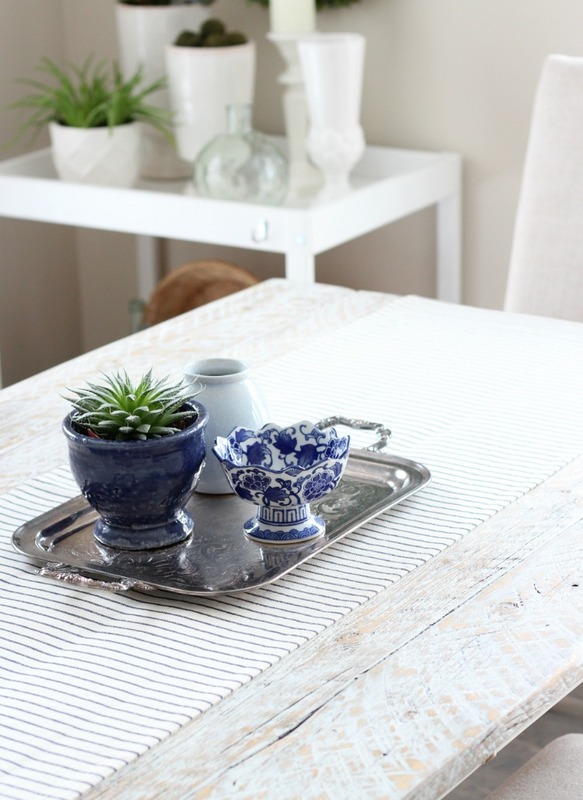 See how I put together this easy table centerpiece using thrift shop finds. 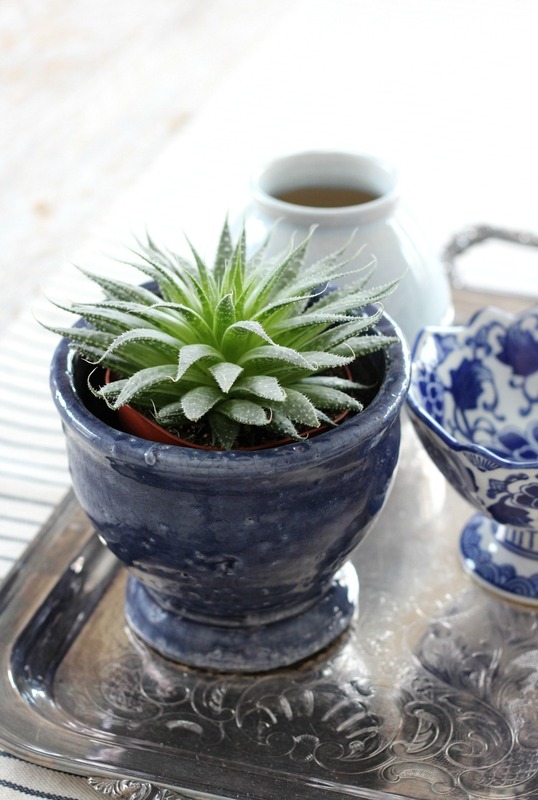 The succulent plant and indigo blue decor are perfect for welcoming Spring! Are you as happy as I am that Spring is almost here? Well, I guess according to the calendar, but I’m not sure when it comes to the weather. I think it’s going to be a very slow transition. Hope I’m wrong. Over the weekend we got another BIG dump of snow, so I decided to play around with some of my recent thrift shop finds to create an easy table centerpiece. I didn’t feel like running out to get tulips or hyacinths, so succulents I picked up a few weeks ago will do for now. You’ll definitely be seeing Spring bulbs in future posts as I adore them so much. Remember the tulip and milk glass centerpiece I put together last year? I may also force some branches to put on our mantel. They’re always so pretty! Did you know IKEA has a good assortment of succulents? They’re plump and lively ones at a reasonable price compared to what I’ve been seeing elsewhere. I picked up two other varieties to put on the corner bar cart and cabinet, and will be picking up more once I start putting together my outdoor planters. Can’t wait to swing open the doors and enjoy some warm and sunny outdoor living! You? The large silver tray is something he found. It has some weight to it, which is something I always look for. I love the detailing on the handles too. You may have noticed I used one for my tea party a bit ago. Such versatile pieces. You can never have too many silver trays in my opinion. I use them for entertaining and corralling decor. 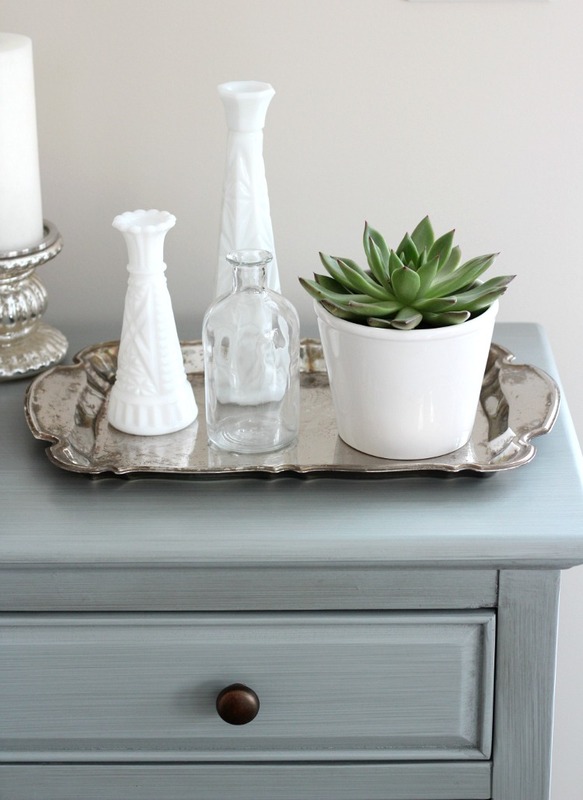 An assortment of small decor pieces always looks better atop a tray. I’m considering hanging a grouping of them on a wall in our kitchen down the road as well. Not too sure yet. 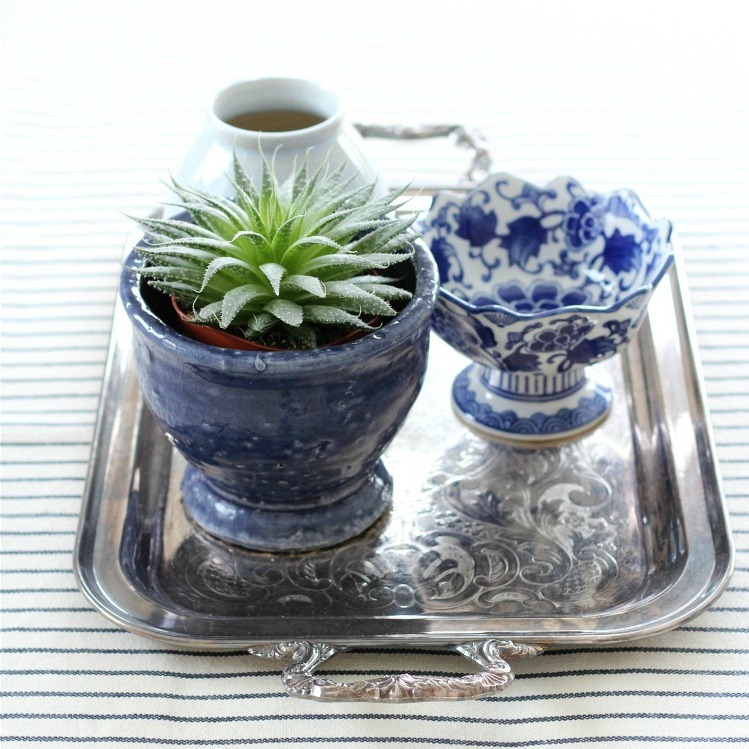 When I bring silver trays home from the thrift shop, I clean them up with some baking soda and water. It doesn’t remove all of the patina, but does get rid of any debris. I like the look of tarnish most of the time. If I’m using them to serve food, I polish them up. Simply boil water in a big pot with crumpled up balls of tin foil. Dip the trays in for a while, remove with tongs and polish with a soft cloth. Works like a charm. The only new piece I added for the time being (aside from the succulent) is the light blue crackle vase. I picked that up at Indigo (on sale, of course) some time ago. They tend to have a lovely selection of seasonal decor. Yesterday, I spotted some fun pillows. 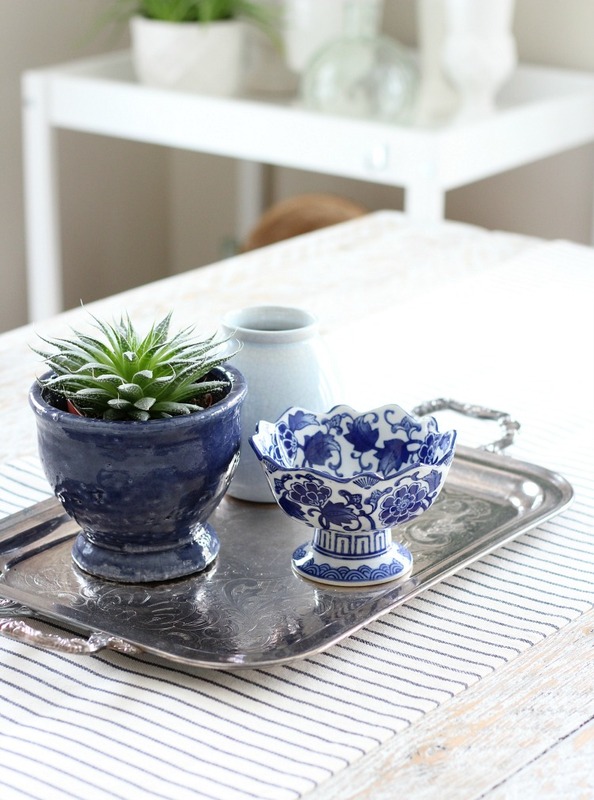 Of course, the chinoiserie candy dish is a favourite find given my love of blue and white dishes. 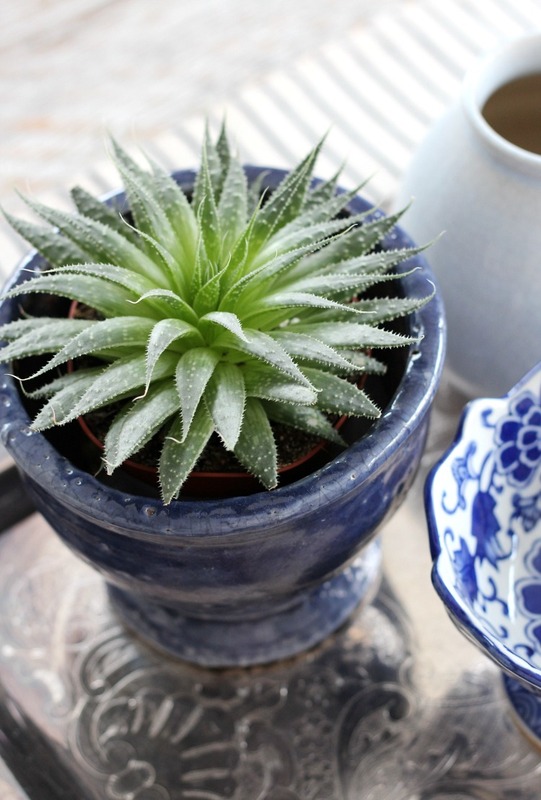 And I simply couldn’t walk away from that deep blue flower pot. It’s handmade quality is gorgeous. Total cost of everything was under $20. That’s definitely a reason to hit up a thrift shop, no? Plus, it’s one of the best sources for building collections like my milk glass. Click here to see our dining room and kitchen sources. Have you started decorating for Spring yet? What are you most looking forward to?